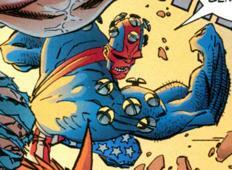 Other Distinguishing Features: Roughneck has screws in his cranium & shoulders, and his skin is red and blue. During the Gang War, Roughneck burst into the Freak Outpost bar and declared that he would be the new leader of the Vicious Circle. This decree was rejected by his would-be minions and he soon fell in with the new ruler. Roughneck later joined up with Chelsea Nirvana’s Frightening Force for a failed mission to eliminate Freak Force. Roughneck returned to the Vicious Circle and remained with them over the years. He took part in the battle at the White House that saw CyberFace getting deposed as ruler of the world. He later was sent by Imposter (along with Bud Ugly and Arachnid) to a presidential home when the shape-shifter was posing as President Bush. They were supposed to ambush Dragon and eliminate him but the villains were defeated instead. When the third OverLord dispatched an army of Vicious Circle members to Hillman Hospital to steal a unit of Dragon’s blood, Roughneck took part in the raid. He was later sent, again with Bud Ugly, to bring PowerHouse to the offices of OverLord. Roughneck showed no respect for the group’s former leader during this encounter. Roughneck is later sent by the Vicious Circle to steal components for Project: Born Again along with Shard and Thunder-Head. He is also one of the very few survivors of OverLord III’s charge against the Tyrrus Combine during their attack on Earth. Roughneck later tries to get Neutron Bob to help him rob a bank, but the plan backfires and he is knocked out by Bob. Roughneck is briefly seen watching Dragon’s trial on TV. Roughneck is present when Dart II kills FirePower and assumes control of the Vicious Circle. He later is part of a search part sent out to find Malcolm, but is brutally beaten by Malcolm during a battle.